Many people use their credit cards to cover their rental car excess. Renters assume that they are fully covered, but are they really? Let’s have a closer look at ANZ’s actual car rental cover policy, which a Tripcover customer brought to our attention, asking if they should still take out a Tripcover policy or use the ANZ rental car coverage. What’s covered and what not by ANZ credit cards? Here’s the thing, most of the large car rental companies, such as Thrifty, have what they describe as a “standard excess”. This excess covers basic damage to the car if it involved in a multi car accident or is stolen, for example. Though there are a number of items not included in the standard excess, and that’s the loophole in credit card travel insurance. Hence it becomes a problem for anyone who is relying on their ANZ credit card insurance (or other credit cards aswell) because items such as windscreens, tyre damage, undercarriage damage are not considered to actually be part of the excess. On top of that, most rental firms in Australia have an excess amount between $3500 and $4000. The ANZ car rental cover falls short by nearly $2000. ANZ only covers $2050 excess. The above screen grab from the ANZ Car Rental Cover terms and conditions, shows the maximum excess insured is just $2400, minus the applicable policy excess, leaves the rental customer will only $2050 maximum coverage. So if the rental car excess is $4000, then there is a gap of $1950 to pay. Ouch! In the above screen grab from ANZ’s terms and conditions, you will notice two things. 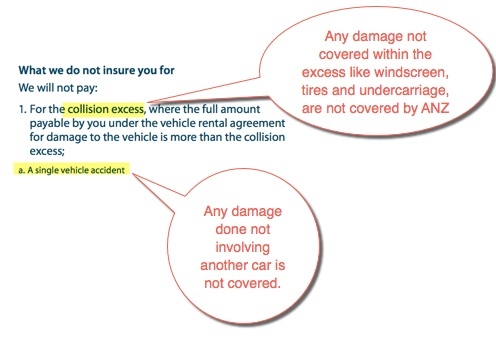 Firstly that the coverage only includes items covered under the collision excess, and as mentioned earlier there are multiple items that rental companies do not include in their excess, but still charge you for, like windscreen and tyre damage etc. Secondly you’ll notice that Single Vehicle accidents aren’t covered by the ANZ policy, which effectively means, if you damage the car in a car park against a static item or you hit a kangaroo on the open road, you wont be covered because there is only one vehicle involved in the accident, namely you! As we previously wrote in our blog post about the pros and cons of car rental insurance via credit cards, there are benefits to using credit cards, especially if you choose the right credit card to pay for the rental, you could actually receive coverage with zero deductible. That being said, its worth looking into the detail, as we have done here with ANZ, to really understand what level of coverage you do have, as opposed to assuming you’re covered, and then being surprised when there is a sizable gap in the coverage.